Do you ever struggle coming up with different meal ideas? Maybe this post will give you a little inspiration. 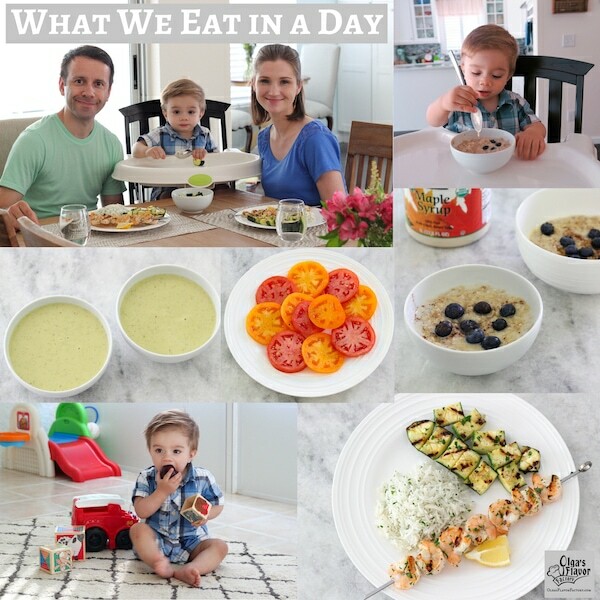 Here’s a fun peak into what my toddler, Nathaniel, (who is currently 15 months) and I eat in a day – breakfast, lunch, dinner and snacks. 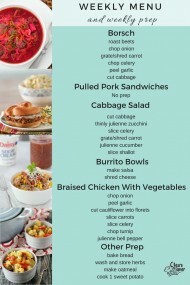 I know that I share a lot of recipes here at Olga’s Flavor Factory, and I get asked all the time for ideas of what to pair with certain recipes to make it a full meal. 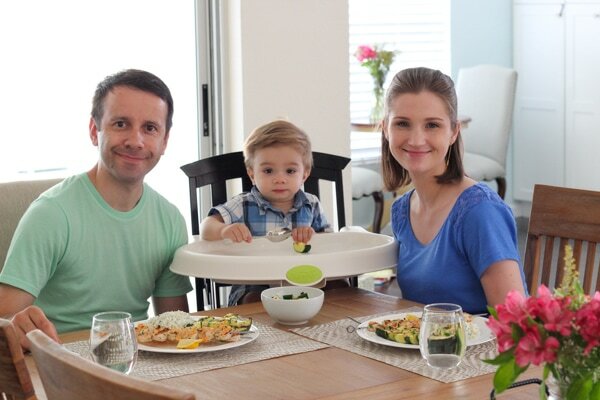 Another frequently asked question is what I feed my baby, so here goes: the secret to what a food blogger eats and feeds her child – it’s all revealed today:). Lol. Of course, what we eat varies a lot, especially since I try out new recipes constantly, but we do have our family favorites that are staples for us, and we enjoy them over and over again. I’m hoping to share more of these types of posts with you, so if you enjoy this one and would like to see more, I’d love to know if that is something that you would be interested in. 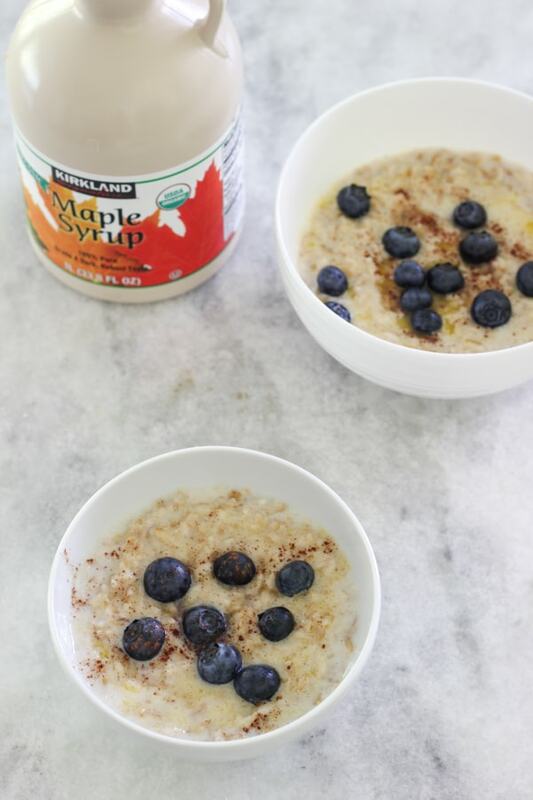 For breakfast, Nathaniel and I had oatmeal with a bit of butter, maple syrup, cinnamon and fresh blueberries. While I am cooking breakfast, Nathaniel is usually whining next to me, and wants to be picked up, so I have to be very quick. 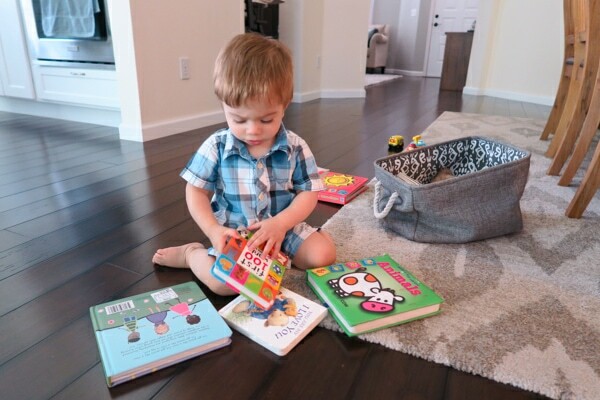 Sometimes though, there are those rare but beautiful mornings when he is happy to play with his toys or look through his books while I am in the kitchen. At least for 10 minutes. Nathaniel LOVES oatmeal and all kinds of porridges, so I make them several times a week. Often I’ll make a large batch, and then just reheat it in the mornings. Easy, peasy. 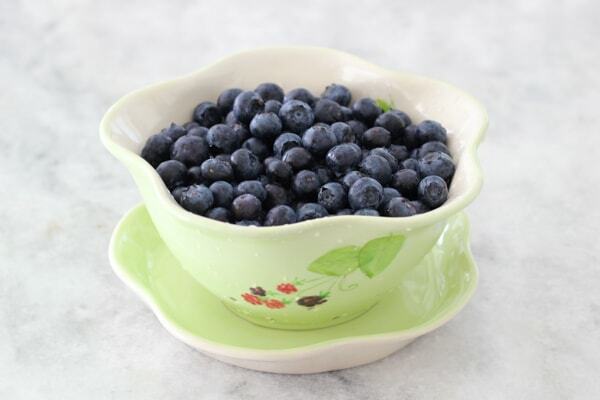 Blueberries are an awesome snack too, so I’ll wash them and pop them in my mouth all day off and on and it’s a perfect snack for babies too, since he can feed himself and loves to pick up those little blue balls with his tiny fingers. I don’t usually have a large lunch. In fact, I’m usually not hungry for lunch, so I keep it extra simple. 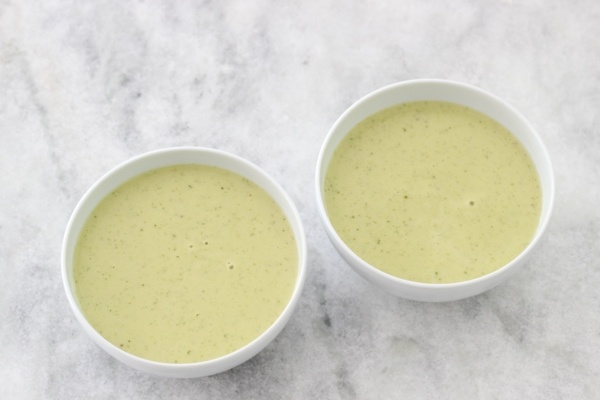 9 times out of 10, I’ll just reheat some leftovers from the day before, which is just what we had on this day – Creamy Zucchini Soup. This is also one of Nathaniel’s all time favorites and he can gobble up a bigger bowl than me. 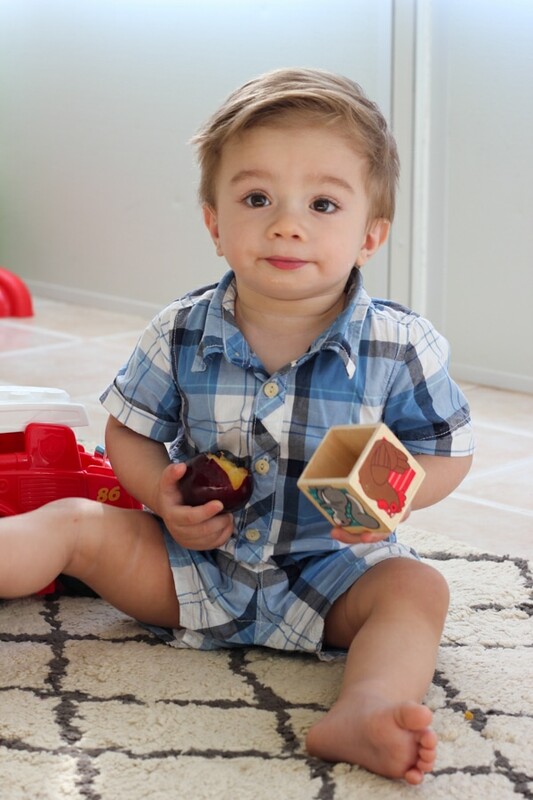 After Nathaniel’s nap, we enjoyed some deliciously sweet and juicy plums. Nathaniel was really into his plum. I just couldn’t resist sharing all these pictures. He is so cute. 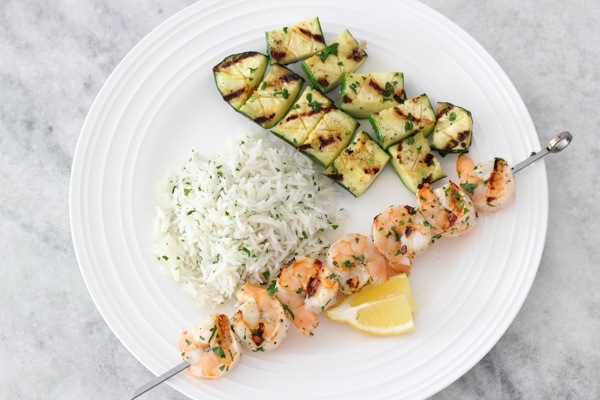 For dinner that day, Sergi came home at a decent hour and grilled these Lemon Garlic Shrimp and while he was at it, he grilled some zucchini too. (I usually prep dinner during Nathaniel’s nap. Sometimes I get most of it done, other times, I have to wait prep with him playing in the kitchen with me, or wait to finish the last steps when Sergi gets home from work.) I could eat a bowl of just the zucchini and I would be completely satisfied. 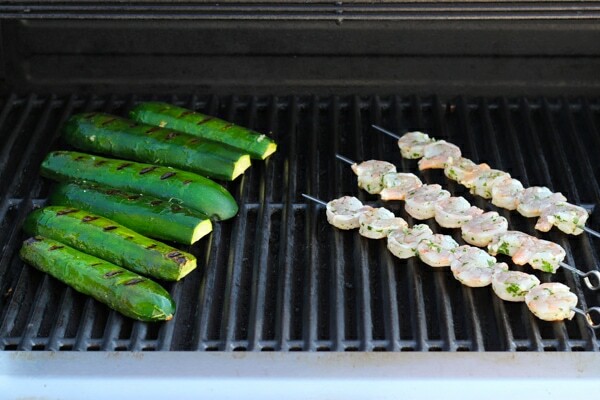 It’s SO delicious on the grill. I just sliced the zucchini in half and then made some criss cross slashes with my knife on the zucchini surface. Then, I drizzled it with avocado oil, seasoned it with salt, ground black pepper, minced garlic and fresh minced parsley. Once the zucchini is grilled, I cut it into pieces. 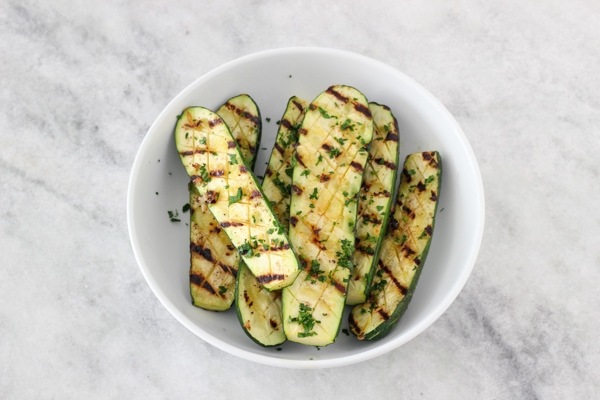 Zucchini is in season right now and we are taking advantage of it for sure. I made Rice Pilaf with parsley to go with our meal. As an after dinner snack, Nathaniel and I had some sliced tomatoes that I just sprinkled with salt and ground black pepper. (Sergi’s doesn’t get eating tomatoes like this, so he skipped this one. 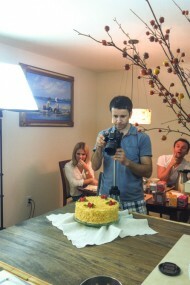 I was happy not to share.) 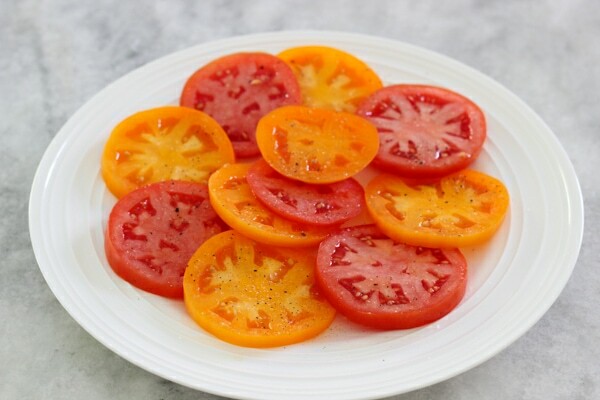 This is a snack I enjoy all the time when tomatoes are in season. Nathaniel shares a love of tomatoes with his Mama, and will not leave my side if I have a plate of these beauties. I was very happy to buy both the plums and the tomatoes at a farmer’s market, and they were incredible – so juicy and fresh! Sergi and I don’t drink anything besides water and tea, so there’s nothing of interest to share on that end. For Nathaniel, I do add a few squirts of a concentrated fruits and vegetables beverage mixture into his water. It has a lot of vitamins, antioxidants and phytonutrients. Plus, it tastes good too:). If I’m home, I drink water from a glass tumbler and if I’m running errands or on a walk or at the park with Nathaniel, I take my water bottle along. 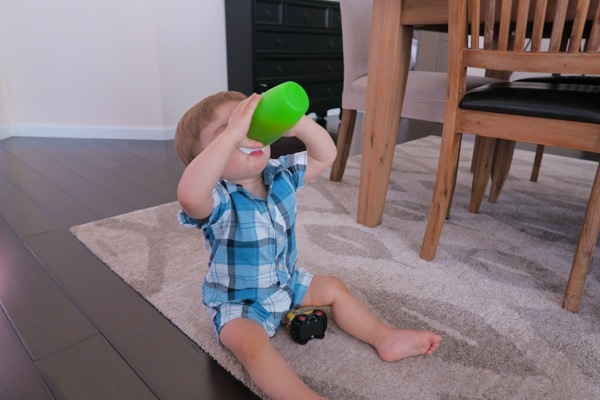 Nathaniel will drink a lot more if I let him use my tumbler or bottle, but in cases where I don’t want to be standing over him making sure he doesn’t drop it or spill it, we have this really convenient cup. I love that it comes completely apart and I can wash every little corner of it, with no extra valves or parts that can mold. 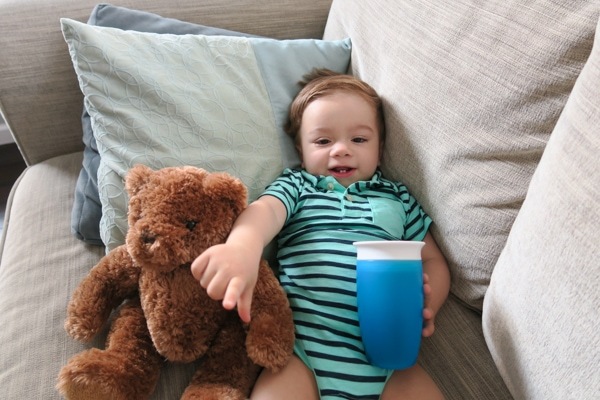 Plus, it’s designed to act just like a cup, so it teaches him how to drink but doesn’t spill. He can just carry it around with him, and even when he tips it over, it doesn’t spill. Nope, this post is not sponsored. I just like sharing the things that we enjoy:). As you can see, I try to keep meals and snacks really simple on most days. Nathaniel eats whatever we are eating most of the time. What are some of your favorite meals and snacks that you cook for your family? He is such a sweetheart and I love reading your blog , the post about your 30th B-day made me cry! Thank you, Laura:). You are so sweet. Lovely post! Pictures are just too cute! Love where Nathaniel is really enjoying that plum!! Valichik is in this stage right now where he is interested to see what happens to anything I give into his hands and starts squeezing everything out of the fruit. Oh the joy of cleaning after an event like that! Lol! But it’s like an adventure for him, “let’s see how squishy and how much goes through my fingers” lol. I can definitely relate:). Nathaniel gets so dirty when he eats something himself:). I usually feed him soups myself, just because it’s still a little hard for him, but when he eats mashed potatoes, tomatoes, anything else, it’s time for a bath:). My boy is almost 15 months old, so this post is perfect, please keep them coming! I always need food ideas, I never really cooked before Tommy was born, and it’s hard to follow complex recipes with a toddler. Your recipes are amazing! I have not given Tommy anything other than milk, formula or water. I would like to give him juice, what brand/ type of fruit/ veggie concentrate do you use? P.S. Nathaniel is adorable! He looks just as delicious as the plum he is eating! !… And I really don’t know how you manage to keep your floors so clean! Good job mama! The floors are definitely a struggle:). Nathaniel gets them so dirty. 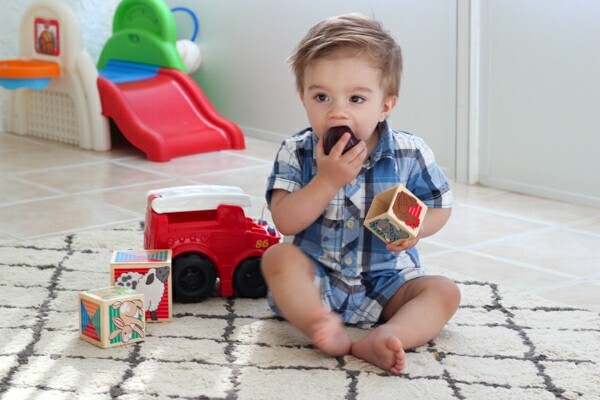 He’s always smearing food and whatever else he is holding all over and there are so much crumbs all the time. I have to sweep and wash them every day to keep up with them and be able to walk without stuff crunching under my feet or being sticky. I’m so glad you enjoyed this post, Diana. 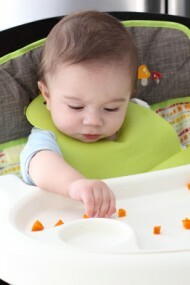 Have fun introducing your little one to food! Wow. I eat double what you eat. I’m like this always hungry horse. Not to mention my boys. I like to make chia pudding for snacks. Our main meals are like yours. Snacks are lots of snacks. Omg. We eat a lot. Fruit, bars, crackers, toasts, protein powder, veggies, nut butters. Mostly organic and as healthy as I can. Without snacks we will die. But everyone works out and kids play lots of sports. I wish all I had to do was cook like you. Nathaniel is so cute. All that hair showed up! And I love that cup. Nothing like this existed when I had babies. You have a very clean house and I can tell you like it all clean by saying why you love this cup lol. I am the same. Now though with two boys wrestling and playing my house is a bit messier but still not bad. Not like yours with everything in place haha. We are not a big traditional snack family. My husband doesn’t eat snacks at all, my toddler won’t eat them and they just aren’t tasty for me. There are days when I’m much hungrier and will eat a lot more than I did on this particular day, but in that case, my snacks are usually scrambled eggs, toast with cheese, sliced tomatoes or cucumbers, yogurt, bagel with cream cheese, fresh or canned fruit. Yes, Nathaniel’s hair is growing like crazy! We’ve given him at least 8 haircuts by now, although it could easily have been more. I’ve lost count:). 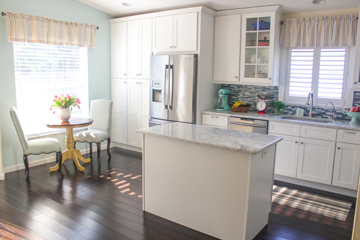 I do love a clean house; it keeps me sane. BUT, it doesn’t stay clean for long with this little guy who gets into everything right now. This was a very chill day, which is why I was able to do this post. On most days, life is too hectic for me to even get the camera out to take pictures of our food, and the house is messier:). I do have to clean after him during nap times and every night, otherwise it would be a disaster. Oh and I absolutely adore the same tomato snack!!! in this day and age where so many families(christian) are broken and struggling, it is so refreshing to see families that thrive and have a Godly atmosphere. thank you for showing us a glimpse of not only your delicious food but of your happy home. i can see so much love in your family and i LOVE it!! as a young mom i foolishly let my kids eat what they liked instead of feeding them what i cooked so now i struggle to get them to eat healthy. it is a constant battle for my husband and i to get them to try new things and like their vegetables. i am still holding hope that there will come a day when i make dinner and everyone will enjoy all that is on the plate. we do have those days but they are very rare. so thumbs up to you and all the other moms who are smart and started their kids out right!! this post did open up my eyes that we snack way too much too as the other person mentioned, but i think when kids get older they just naturally eat a lot more especially now that summer vacation has started. i love zucchini and always like to see neat ways of preparing it, i will have to try this soup! i love your blog, it’s fun and tasty!! May God continue to bless you and your family with all His riches, and keep inspiring others couples to love each other deeply. it is not what we have in life that matters but loved ones that are in our lives. 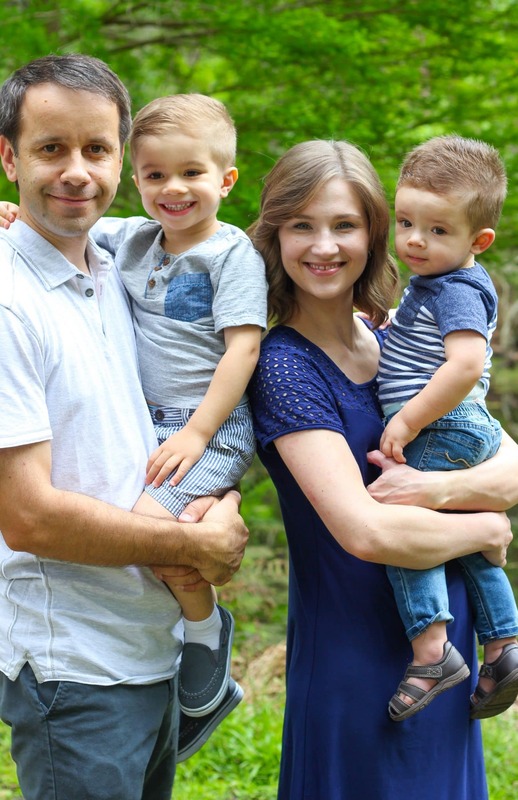 love your beautiful family and the cute pictures!! After this post I tried to remember what I was eating when I had only 1 year old child and it was similar to Olya’s menu. No snack bars, crackers etc. Twice less food than now haha. Well, twice less people too. More children = A LOT more food:). Thank you so much for your encouraging words, Tanya. I really appreciate them. My family is such blessing and I thank God for them. I definitely agree that children eat a lot more when they are older. 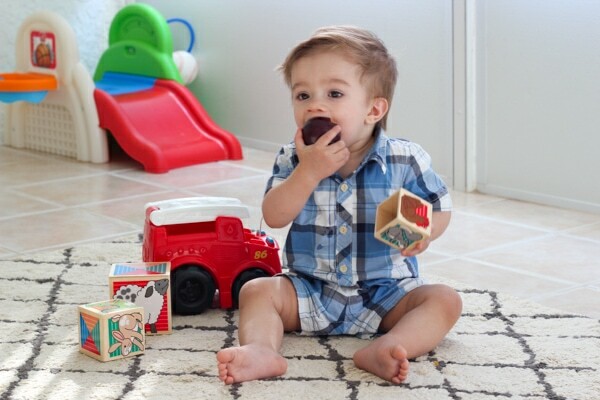 Right now Nathaniel is only 15 months, so he is in the stage of trying different textures, flavors and is still discovering all the different foods. He also doesn’t really like typical children’s snacks, even when I offered them to him in the past, like crackers, fruit pouches, and other snacks like granola bars, cereal bars, chips, etc. He would only take a bite and refuse the rest. Thank you for your sweet note, Rita:). I love this post. It would be interesting to see more like it. 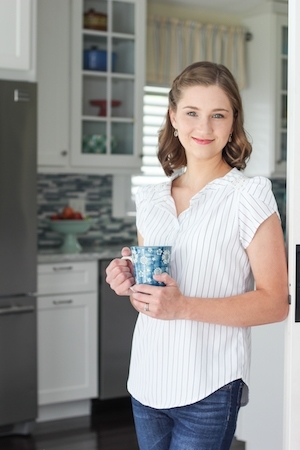 It gives menu ideas and inspires me to keep cooking and snacking healthy when I see you do it, too. Thank you, Jenny. I’m glad you enjoyed it and I it was really fun for me to share it too. Oh I love to see pictures of Nathaniel! He really is a cutie, especially holding that plum, absolutely precious! I have a 18 month daughter myself and constantly trying to make fun yet healthy meals she can enjoy as well. 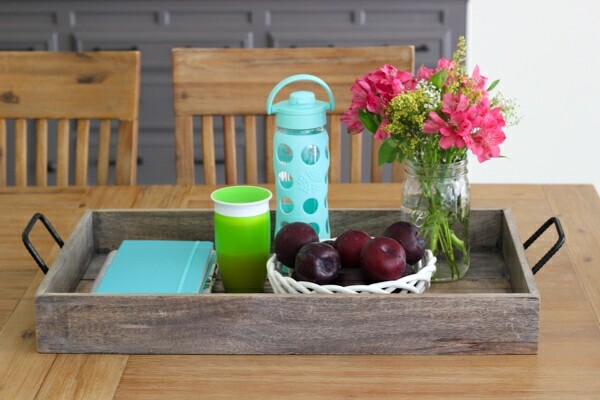 Loved this post Olga! More of these please! Does Nathaniel feed himself when it comes to oatmeal? My daughter does great with a fork, but not with spoon yet, any tips or tricks? Thank you, Inna; He is a cutie:). 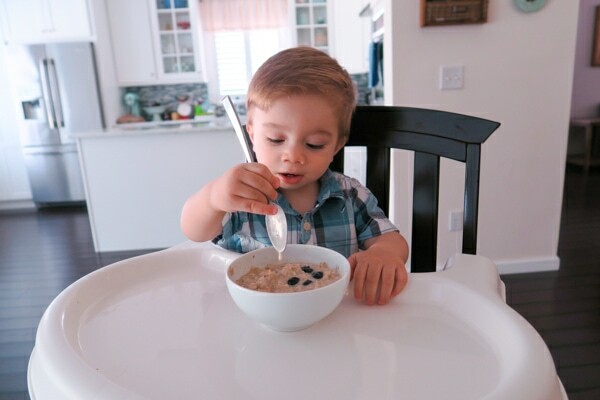 I do let him “try” eating oatmeal with a spoon, but it’s just for fun and practice mostly. He feeds himself solid foods, but I feed him soups and oatmeal, since I make it on the runnier side for him. He always makes a huge mess, though. My trick is to take his clothes off and let him have at it:). Honestly, we don’t really give our boys anything to drink besides water, milk and very rarely, watered down orange juice. Hi Olga. I am 75 years old and admire your Faith and inner strength. I love reading your blog and seeing your two beautiful boys flourish. You are looking lovely . I know you have had a rough road and guess u still have problems. Keep up whatever you are doing with God’s help. See lots of love in your home. Take good care your little guys need u. Thank you so much for taking the time to write, Elaine. I really appreciate your kind words. Our family is doing really well and we are so grateful for our two little boys. God has been so good to us:).